From the Hancock County courthouse, follow Hwy 15 southeast for 2.3 miles to Shoal Rd on left. Turn left and go 6.3 miles to Hickory Grove Church Rd on the left. Turn left and go 0.1 mile to Hickory Grove Church and the cemetery on your right. 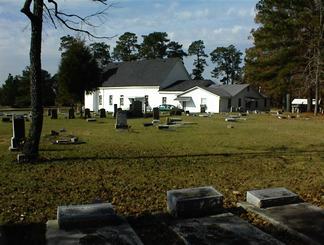 The graves were surveyed as follows: as you face the church and the cemetery from Hickory Grove Rd, the rows go left to right and from the front of the cemetery to the back. 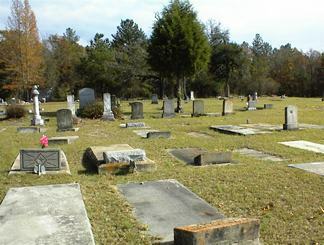 One row consists of a single line of graves. Hickory Grove Church was founded in 1865, and its founders were all prior members of Bethel Baptist Church. The church building was dedicated on September 15, 1868 (See The Land Between by Forrest Shivers). Graves added since the original survey are numbered 500 and higher and should be buried somewhere in the cemetery. Age 40. All info per funeral home marker. "Father". Devoted Husband, Supportive Father, Friend in Deed. Mother waits for us in Heaven. "In memory of" "At rest"
In God's Care (open Bible). Mother. Love / Your children. Has "Mom" in flowers on grave. Age 85. All info per funeral home tag. "A Servant of God" "At Rest"
A Servant of God. At Rest. Age 76. Loose funeral home marker assumed to belong to this grave. Surrounded by rocks and pottery "posts". He was attendable to his wife and family. Masonic emblem on marker. Only one date on stone. Assumed to be death date. Georgia Pvt 370 Inf 93 Div. Sleep on, we love you. A servant of God. A Loving Father. On same gravestone as Omie Thompson. On same gravstone as Sidney Thompson. Grave marked by a small piece of granite and iron stake with 2-link chain in a figure 8. To My Husband. Gone but not forgotten. Piece of stone on German Moss' grave. Only thing readable is Lucy. Last name and dates per Kimbrough. At foot of grave 171. Gravestone difficult to read, but info matches Kimbrough's list. Age 76 years. Happy is he whose hope is in the Lord. Pastored and built many churches. Converted 1866 joined Horup Baptist Church. Baptized by Rev. Coher Stephen. One of the organizers of Union Baptist and founder of Hickory Grove & Macedonia Baptist Churches. An infant slab with only one date. Birth and death date assumed to be the same. Erected by Second Shiloh Assoc. and S.S. Convention. Rev. N.T. Thompson / Moderator Second Shiloh Assoc. 1901-1934, Pres. S.S. Convention 1895-1934. No dates. Gravestone crumbling. Under same monument as at the head of grave 206. Only "H" remains as part of last name - last name gone. Last name per Kimbrough. Marked by unreadable funeral home tag. Age 49. All info from funeral home tag from Sandersville, Ga. Birth year and age difficult to read. h/o Clara. "In memory of"
Name unreadable. Death year questionable. A granite fieldstone may mark a grave. In after time we will meet her. Gravestone is in the style of a tree trunk. "In memory of". s/o Scott & Martha A. Chatman. Asleep in Jesus. h/o Abbie Southern. "Sleep on I love thee, but God love thee best" Gravestone is broken. Age 61 yrs. All info per funeral home marker. Handwritten on gravestone. No dates. Mother of Jimmie Wilson. All info per Harrell Lawson. Sister of Effie Wilson, aunt of Jimmie Wilson. All info per Harrell Lawson. Come Ye Blessed. Twas Hard To Give Thee Up, But Thy Will O God Be Done. Age 59. Last name is difficult to read. Broken gravestone. Gravestone read as Commings, but correct spelling probably Cummings. Last name probably Humphrey but spelled Humprey on stone. Age 73. All info per funeral home marker. Ga. Pvt Co E 1 Training Bn. A simple cross is engraved on the slab. Empty space on gravestone. Same gravestone as Nazareth Chapple's. Martha Ashler / Ashley ? A broken and misplaced stone. Broken stone - possible grave. Age 47 years. "Mother we miss thee"
Handwritten. Very difficult to read. First name difficult to read. "Father" "Thy Work Was Well Done"
Space for grave on same marker as Masouver Ingram's. "Mother" On same marker as Boysie Ingram. "Father" On same marker as Mattie Mae Ingram. No death date. On same stone as Claudia Mae Ingram. On same gravestone as Earnest "Jack" Ingram. s/o Rev. and Mrs. Michael G. Ephraim, Sr. In same grave as Edwin Ephraim. s/o Rev. and Mrs. Michael G. Ephraim, Sr. In same grave as Earnest Ephraim. "Father" An empty place for grave 343 appears on this stone. Empty place on gravestone of Tommie Ingram, Sr.
"Anybody can be a father but not everyone can be a daddy." Age 72. A crease at the birth year makes it difficult to read. Should be 1920 if age is correct. All info per funeral home tag. All info per Dessie Wilson, descendant. Round fieldstone marker with illegible markings. Beloved one at rest. Broken stone. Adult-sized slab difficult to read. Some possible depressions in the middle of the cemetery. w/o William Mills. "Our Loved One"
Age 67 years. All info per G. L. Haynes funeral home tag. Age about 62 years. "He was faithful in all the relations of life. Asleep in Jesus blessed sleep from which none ever wake to weep." Very large slab may cover 2 graves. "We will miss you deeply"
"The Duke" "Beloved Father, Son, Grandfather Forever in Our Hearts"
Large slab with headstone. Writing obliterated. Not found in 2002. Name per Kimbrough list. Age 31. All info per obituary. Age 43. All info per obituary. Age 65. All info per obituary. Age 42. All info per obituary. Age 76. All info per obituary. Age 86. All info per obituary. Age 91. All info per obituary. Infant All info per obituary. Age 95. Died in New Orleans, LA. All info per obituary. Age 66. All info per obituary. Age 51. "BoBo". All info per obituary. Age 63. "Ceil". All info per obituary. Age 57. Of Erie, PA, formerly of Sparta, GA. All info per obituary. Age 69. All info per obituary. Age 61. All info per obituary. Age 75. All info per obituary. Age 60. All info per obituary. Age 59. All info per obituary. Age 82. All info per obituary. Age 39. All info per obituary. Age 85. All info per obituary. Age 57. All info per obituary. Age 74. All info per obituary. Age 84. All info per obituary. Age 54. All info per obituary. Age 71. All info per obituary. Age 33. All info per obituary. Age 93. All info per obituary. Age 83. All info per obituary.